I think I've probably mentioned on the blog before that I'm keen to get my teeth whitened. I've looked into laser teeth-whitening a few times but to be really honest I'm a little bit afraid of it and I'm not entirely sure why! I plucked up the courage once and booked in and then on the day I was due to go I came down with a sickness bug - I think I was relieved to have a good excuse to chicken out! I haven't gotten around to manning up and re-booking yet, and perhaps I won't need to as Rio have sent me a teeth whitening kit I can use myself for some less scary at home teeth whitening instead. Rio have a huge range of professional beauty solutions covering dental hygiene, electrolysis, eyebrow threading, nail art and loads more. I've tried their roller waxer before and was very impressed with it, so I'm quite confident about trying out the teeth whitener. I'm also thinking about trying their 14 day UV polish kit which is like a gel top and base coat you can use with normal nail polish colours to make a mani it last for two weeks - my nails usually chip in two days so that would be amazing! So anyway, I thought I'd introduce the teeth whitening kit to you now and share my first impressions, and then I'll do another post after I've been using it and hopefully I'll have some impressive before and after shots of my pearly whites. I've tried teeth whitening strips before - the stronger ones you get from the US - but I didn't get on very well with them. I didn't like the feel of the strips on my teeth and (sorry if this is too much information!) I felt like my mouth was filling with saliva and I just couldn't stand keeping them on for very long. Teeth whitening toothpastes only ever brighten slightly or whiten by a single shade, so I'm really hoping this kit will be the answer for me. *Rio's professional teeth whitening system costs £79.99 and it really does look rather clinical and very professional to me. 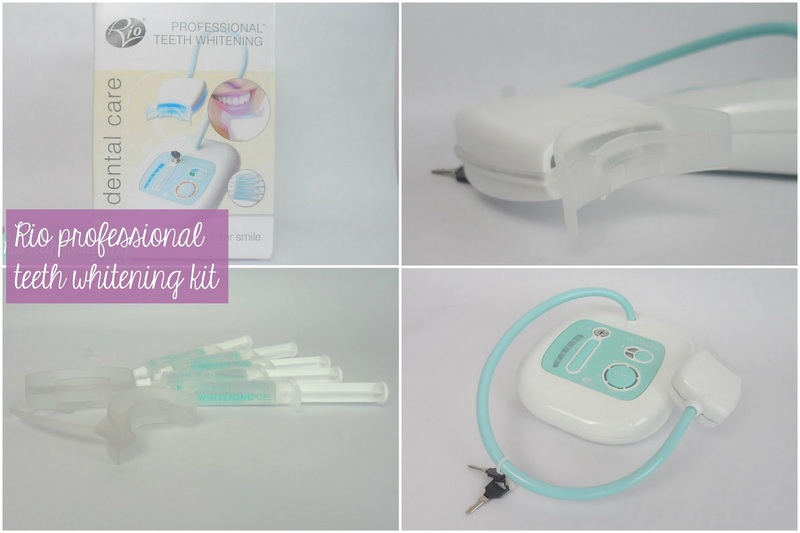 It comes with mouthpieces which you mould to the shape of your own mouth (by popping them in hot water) for a neat fit, the whitening gels and then the machine which delivers the blue-light technology to do the whitening magic. You only need to use it for 20 minutes at a time - so that sounds much more appealing to me than the strips I'd tried before which you were supposed to keep in all night. I'm not sure how many times I'll need to use the kit to get the level of bright whiteness I'm after (not quite Simon Cowell gnashers but close!) so I'll give it a go and then report back with some comparisons to see how much whiter my teeth are. If you've got any teeth whitening tips for me, please leave them in the comments - I'd love to know if you've tried something like this too and how you got on. I'd love to try a teeth whitening kit but I'm afraid I'll damage my teeth or something :) I'm going to buy the Crest one in September when I'm going to NYC though, we'll see how that goes. Really enjoyed reading this! Great post! I'd love to try this - I have looked at it a few times but I have a cap on one tooth and I always think it will look a bit silly if I whiten the others! Your blog by the way, remains my favourite of all time! Have been following for about 2 years! Nice port, I have been looking for a good teeth whitening kit. There are so many types it's hard to know what's the best - hoping this is the one for me - will report back! Rio professional teeth whitening kit is good whitening product. actually, i am using Colgate Optic White Platinum. It's working good. Thanks for sharing.